Is it fall yet? All this heat is just a bit much for me. I need to learn how to work remotely from the river or the beach then it won’t be so bad. For those of you who have air conditioning… I am free to come over every evening and on weekends. I hope you all stay cool in whatever way you can! Clean pet bedding. Please make sure that if you are cleaning up bedding from an animal that you are putting any feces in that bedding into the trash and not into the laundry. If it needs to be picked off the blanket please use a glove and remove it from the laundry. DO NOT put soiled blankets or towels back into a kennel with an animal they always get clean ones. Just imagine you are the one going to throw in a load of laundry and you reach your hand into a pile of poop. Not a pleasant experience. Laundry is already one of things that people don’t love to do, let’s not turn them off of it anymore! All animals need to have beds! Kuranda beds are the preference so that the pets all have something get them up off the cold metal kennel bottom or the concrete floor. A couple of blankets on the floor can easily become cold as well so getting them up off of the floor makes them much more comfortable. If you know of a clean kuranda bed not being used and there is a dog without one please move it to the kennel with the animal that needs it. All kuranda beds for cats and dogs are to be cleaned inside of the kennel in the same fashion that the kennels are cleaned. There have been an awful lot of absences lately! Please contact your team captains in advance. Respect the time and work it takes for your captains and your teammates. Thank you!! Jolene Jones, Caroline Patton, Marianne Fox and all the afternoon Sunday Dog Walkers who helped me catch up with taking pictures of 22 new dogs on the 12th. Jolene, Caroline and Marianne came expressly to help me by bringing out the dogs, and the Sunday walkers are always so willing to help me as they walk the newbies. I’m so grateful! Carol Black is doing an amazing job working on Rx with our dogs. She comes prepared with plenty of supplies which she has purchased herself. I saw her spend close to two hours with Pal the other day which he really needed and thoroughly enjoyed. She is just fantastic. It’s time to shop for WHS! Chico’s at Salem Center is hosting a fashion show for your favorite shelter! 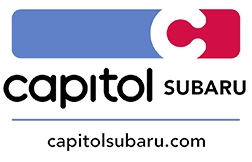 Swing by Salem’s downtown mall on Wednesday, Aug 5th at 6 p.m. to see all the latest fashions. WHS volunteers (we still need a few folks if you want to participate) and dogs! will walk the catwalk. 10% of proceeds from the evening benefit Willamette Humane. To model or for questions, contact Meredith at meredith.kuhl@whs4pets.org or 503-585-5900 ext. 304. If you are able to volunteer as a model for our fashion show you will need to come in early and you have the option of bringing your own dog to strut their stuff alongside of you in the show! The thrift store will be having a back to school sale on Friday and Saturday August 8th and 9th. I bet you could get a lot of cool supplies and some nice clothes for a great price! Talk about easy on the budget! Plus as a volunteer you are getting 25% any other day as well! I heard today that Bowser’s Boo Bash is only 13 weeks away. That may sound like a lot. I don’t know about you, but my weeks fly by with as much fun as I am having here. It’s going to be party time before we know it. One step at a time Kimmi! Right now we are focusing on donations for auction items. I know that I will have great handmade ornaments! We are hearing again that the Virkon is being left in cat cages. If you spray a kennel and you have not wiped it down you need to make sure there is a sign that says 10 min soak. Once it has soaked for 10 minutes then you come back with a clean damp rag and wipe out the Virkon. When Virkon dries and is left on a kennel it can cause chemical burns to our kitties. It is very important that we follow all the steps to a clean cat kennel. Every step is there because every step in important. If you are on your way out and unable to finish please make sure the next volunteers or members of our animal welfare team are aware that there are soaking kennels that need to be wiped out. You all are wonderful for taking care of our cats. I know that we need a reminder once in a while about processes here. If you need a refresher the 7 steps to a clean kennel are posted on the inside of the upper cupboard doors in A and B cats. Thank you all for being thorough from here on out! Have you seen the Big 50 in the hall by the kitten room? If not go check it out. The goal is to fill in the 50 with pictures from happy tails. Pictures of pets adopted from WHS. If you have an adopted pet from here please bring in and put up a picture. If you have a friend or a family member who adopted from us ask them to give you one to bring in as well. We will not be contacting anyone to come back in to get the pictures so make sure it is a copy you do not necessarily need back. I am getting a few pictures of Vinny together to decide which one will be the best one! Humane Fest was a great way for us to connect with other rescue organizations and vendors. Smoothies were very popular, and we had a decent turn out overall. The heat was kind of a bummer, and there was no playgroup for dogs due to the heat. Thank you for those that came out to show your support, and we hope to see you at Yappy Hour! This video is dedicated to Jean Dion cause we know she would love it. Also this is a great idea for enrichment for dogs! 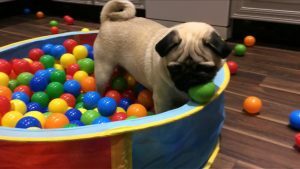 Pugs in a ball pit! On average, 25% of shelter dogs are purebred! Remember the two rotties we recently had? Remember Cindy Lou? Many of the dogs that come through here are purebred. Tell your friends who are looking for just the right dog that there is a chance it will come through here and the best way to know… is to be a volunteer! Let’s take a minute to congratulate Sarah on her recent promotion to Intake Supervisor. She started out as a dog walker and helped Martha with blog pictures. She has a heart for senior pets with sweet dispositions. Feel free to ask Sarah for help with any animal care task as she really knows her way around WHS and how we do things! Sarah enjoys crafts and thrift store shopping adventures! 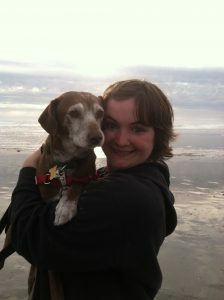 She adopted her sweet dog from here here, pictured above is Sarah and Gimli.